This captivating book is an appreciation of a structure as a practical work of art, a recognized modern pop icon, exploring the history and people who surround it and own it. 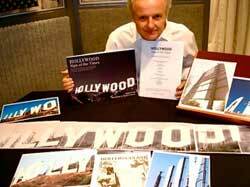 A book of the history of the famous HOLLYWOOD sign has never been published. The myths and fiction about the Sign have now been buried! the true stories can be told. I said 'Well I'll buy one of them. I'll do the 'W'...."
• Chapter by Chapter - Year by Year time line. Just the title tells you that this book is a journey through one of the most famous and exciting contemporary landmarks to be born in the 20th century. This captivating book is an appreciation of a structure as a practical work (of art), exploring the history and people who surround it and own it. This is a fascinating tale of planning, financing and design to erect one of the most unique images in the world that is now trademarked by the Hollywood Chamber of Commerce and maintained by the Hollywood Sign Trust. All the facts and figures of the who, what, why, when and how. A book that takes you through a time line of events with stunning archive pictures. From 1923 to its subsequent neglect in the 1970’s to its glory of today. Adrian Sear has methodically researched a richly informative account that takes us through the story of the Hollywood Sign, from the real estate hoarding to the image it represents today in Los Angeles’ movie factory.